A well-balanced carb-intensive breakfast can be a healthy choice, and with the right ingredients, it can be great for someone with acid reflux. Baked goods, even ones that are billed as healthy (as opposed to a donut), are an easy way to consume lots of sugar and fat that you’re not intending to consume. Many muffins, for instance, are only about as healthy as a cupcake without frosting. These recipes, however, keep the sugar low and include protein. Just don’t go crazy with the butter and syrup, and you’ll keep these recipes nice and healthy. In a large mixing bowl, add the eggs, milk, vanilla, cinnamon, and salt. Whisk until smooth. Soak the bread slices in the egg mixture until saturated, about 30 seconds each side. Cook in batches until the bread turns golden brown, about 4 minutes each side. Repeat until all the slices are cooked. 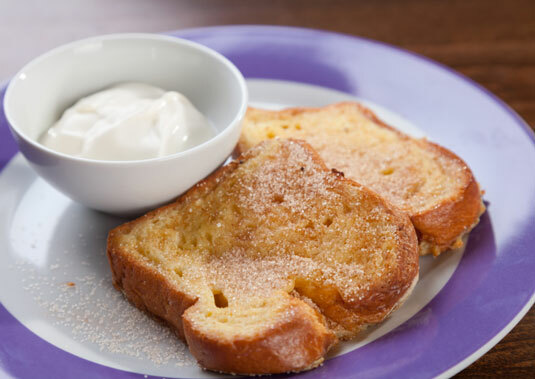 Top the French toast with dollops of yogurt and bananas. Drizzle the maple syrup on top. Per serving: Calories 322 (From Fat 66); Fat 7g (Saturated 3g); Cholesterol 146mg; Sodium 475mg; Carbohydrate 49g (Dietary Fiber 5g); Protein 17g. Not bananas for bananas? No problem! Any other type of fruit will taste good on this French toast. If you’re not in the mood for fruit, try chopped nuts. Preheat the oven to 375 degrees F. Line a 12-cup muffin pan with paper liners or grease the pan with olive oil; set aside. In a 1-quart saucepan, combine the pear and pear nectar. Bring the mixture to a boil over medium heat. Reduce the heat to low and simmer for 3 minutes. Remove the pear mixture from the heat and mash it until it’s smooth. Let the mixture cool for 15 minutes. In a large bowl, combine the flour, oats, flaxseed, sugar flakes (if desired), baking powder, baking soda, cinnamon, cardamom, and sea salt. Mix well. In a small bowl, combine the cooled pear mixture, eggs, almond milk, butter, vanilla, and banana; mix well. Add the pear mixture to the dry ingredients and stir just until combined. Stir in the walnuts. Spoon the batter into the prepared muffin pan. Bake for 15 to 20 minutes, or until the muffins are set and lightly browned. Remove the muffins from the pan and cool them on a wire rack. Per serving: Calories 180 (From Fat 92); Fat 10g (Saturated 2g); Cholesterol 41mg; Sodium 185mg; Carbohydrate 18g; Dietary Fiber 3g; Protein 5g. To preserve the muffins’ freshness, store them in an airtight container.